Do you have a strong grantseeking culture? When you find a perfect grant opportunity for one of your faculty members and you send it on to the PI, what kind of response do you get? If your PIs are dragging their feet about grantseeking, your institution may not have a strong grantseeking culture. Why a strong grantseeking culture is essential for grant success. 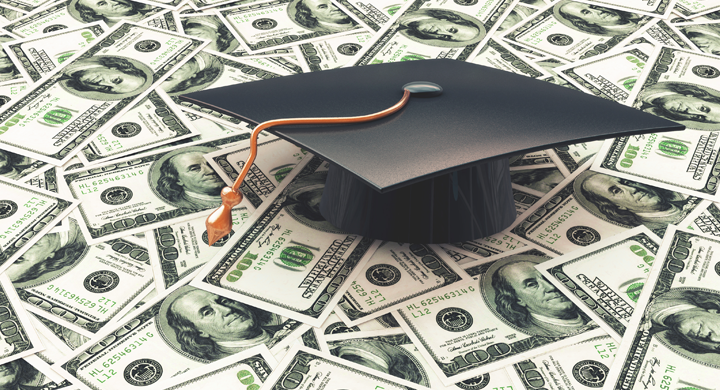 Across the higher education landscape, institutions are looking to build their grants portfolios—for the sake of prestige, new projects, cutting edge research, and, of course, the steady stream of funding from indirect costs. But, too often, administrators are trying to build institutional grant portfolios without taking stock of, or working to improve, institutional grantseeking culture. Hanover’s Grants Team has worked with hundreds of grantseeking institutions across the spectrum of capacity and experience, and we can tell you that institutional culture makes all the difference between success and frustration when it comes to grantseeking. In an institution with a strong grantseeking culture, PIs are motivated to seek grants, they understand how the process works, and they know how to access resources to support the grantseeking process. From idea to implementation, grantseeking happens as it should, grant proposals are high quality, and grant submissions are competitive. Without a strong grantseeking culture, fear, confusion, and foot-dragging reign: grantseeking processes are difficult and often interrupted, the grants that are submitted are not as strong as they could be, and the institution’s grants portfolio stagnates. How to build a strong grantseeking culture. We use the four “Ins” to help clients build a strong institutional grantseeking culture: Inspire, Integrate, Incentivize, and Inform. Your PIs need to be excited about grants. Use marketing strategies to help different audiences of potential grantseekers understand what grants can do for them. Spotlight grant-funded projects, publicly recognize grant success, and be creative about communicating with your specific audience of grantseekers. Grants should be “in the air” of the institution, and administrators and PIs should be talking about them. Grants need to be a seamless part of institutional functioning. Grantseeking should never be seen as “extra.” Make sure you have all the necessary systems in place to support grantseeking on an institutional level (e.g., pre- and post-award support), and make sure grantseeking is built into institutional and individual planning and goal-setting. Everyone should understand that grantseeking activities are part of their individual work and the work of the institution. Potential grantseekers need to know what’s in it for them. Concrete incentives can be especially useful early in the process of building a grantseeking culture, when you need to break old habits and establish new ones. Course-release time for grantseeking and grant implementation can motivate individual faculty members, especially when teaching loads are a concern. To motivate administrators, make sure that indirect costs are channeled, at least in part, into departmental and school budgets. In Hanover’s experience, carrots tend to work better than sticks to incentivize grantseeking—think creatively about what the key barriers are at your institution, and what positive incentives will help your grantseekers move beyond them. Everyone involved in the grantseeking process needs to understand how the process works, how to access the information and tools they need, and how to build their skills for grantseeking success. Make sure grantseekers have access to high quality tools for prospecting, proposal development, and grant management, as well as professional consultation, draft review, and editing. Provide opportunities for training and skill development at all levels, from novice grantseekers to seasoned grant-funded researchers. Remember: informed grantseekers are effective grantseekers. Watch our recent webinar on building a strong grantseeking culture. 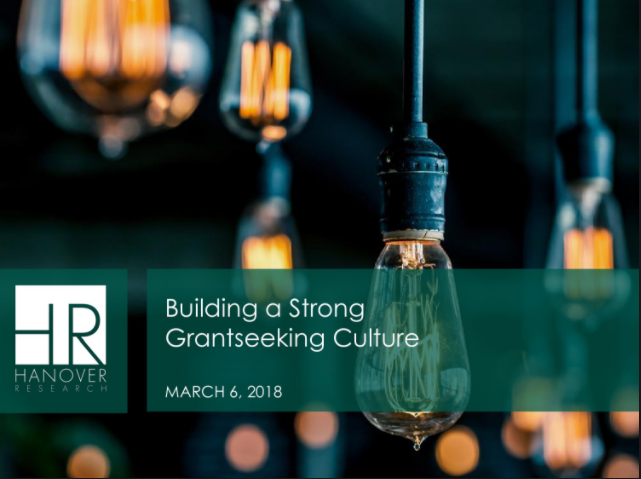 In our presentation, we cover the elements of a strong grantseeking culture, why you need one, and specific strategies to support higher output and higher quality grant development activity on campus.